was old hat. Not only had readers seen endless iterations of the theme (such as The Black Hood, The Blue Beetle and The Woman in Red) — it had also become recognized, even within that simplistic, action-oriented genre, that greater injustice results when such restraints are removed. So it seems odd for a brand-new one to appear from DC Comics during that decade, but these are, after all, comic books, where the odd and unusual are commonplace. Adrian Chase had been a district attorney, but gave up that occupation when vengeful criminals killed his family. Unable to stand the frustration of watching criminals go free as a result of legal technicalities (which is what they call Constitutional rights that are exercised in a courtroom) that had nothing to do with their guilt or innocence, he learned combat skills and made himself a superhero outfit, fully equipped with heavy armament, to specialize in bringing justice to such cases. He called himself The Vigilante not to imply a connection with an old-time DC hero of that name, but simply because it's what people who behave that way are called. Writer Marv Wolfman (Nova, Dracula) and artist George Pérez (Avengers, Justice League of America) were fully aware of the ramifications when they introduced the character in New Teen Titans Annual #2 (1983). 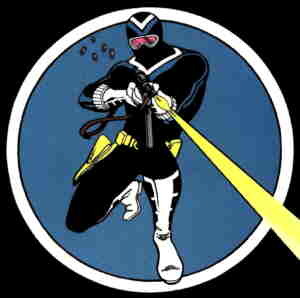 That's why Vigilante was the first such character in which the true consequences of such behavior were explored. The exploration was conducted in subsequent appearances with the Titans, and in his his own monthly title, which started with a cover date of October, 1983, almost immediately after the character's introduction. Vigilante meted out a great deal of justice — but also, through his ruthless disregard for the legal safeguards that protect us all, innocent and guilty, from simply being railroaded into prison whenever authorities suspect we may have commited a crime — a great deal of the opposite. But Adrian was, at his core, an honest man. When he realized he'd become what he most hated, he dealt with himself the same way he'd dealt with others. In the 50th issue (February, 1988), he brought his series to a close by shooting himself dead. Since then, there have been one or two more DC heroes of that name. But this Vigilante is gone. Text ©2005 Donald D. Markstein. Art © DC Comics.